Karl Barth's famous account of the doctrine of election in his mammoth Church Dogmatics has been described as the heart of his theology--a great hymn to the grace of God in Christ. He maintained that "we must look away from all others, and excluding all side glances or secondary thoughts, we must look only upon the name of Jesus Christ." God's election is primarily about his self-decision or self-determination, not about his election of individuals.In this book we discover Barth's fascinating French connection: pastor/theologian Pierre Maury (1890-1956). His close friendship, and especially a paper he gave in 1936 helped stimulate Barth's reflection. Also included are some never-before-translated works of Maury as well as a revision of a previously published piece on predestination. Four theologians then reflect on their significance for us today from historical, textual, pastoral, and theological standpoints, and seek to draw conclusions for us in our contemporary setting, sixty to eighty years from their original composition. 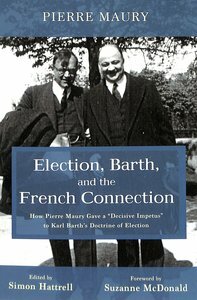 About "Election, Barth, and the French Connection"